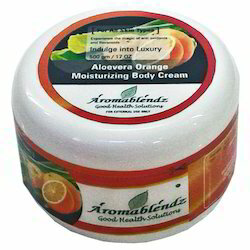 Our product range includes a wide range of aromablendz aloevera orange moisturizing body cream, aromablendz tea tree body cream and aromablendz vanilla shea butter body cream. Aloe vera & Orange Moisturizing Cream offered comes in pure herbal constitution and supports the needs of softening skin with presence of orange essential oil and aloe vera extract adding to the product’s high effectiveness in keeping the skin soft and supple. Some of its features include provide for balanced pH value, lightens the skin, suitable for all skin types, helps in revitalizing the skin and making it clear, smooth and wrinkle free, helps in removing age spots, black spot and dark circles from the face, moisturizes skin and make it soft, smooth and supple. Uses & Benefits: Our Tea tree oil is especially recommended for skin that needs maximum hydration. After a shower, at work, at the pool .. there are times it is necessary to hydrate our skin. There's nothing better than the combination of sweet almond oil and 100% natural aloe vera. Ingredients: Aqueous Infusion of Certified Organic Extract of Almond, Sunflower Seed Oil, Organic Jojoba Seed Oil, Sweet Almond Oil, Aloevera extracts, Glycerin, Shea Butter , Emulsifying Wax, Stearic Acid, Proprietary Blend of Essential Oils, Glyceryl Stearate, Carnauba Wax, Sodium Hydroxide, Potassium Sorbate, Phenoxyethanol, Potassium Glutamate. Use & Benefits: A rich and hydrating cream that provides deep hydration and moisture. This smooth cream is much thicker than a lotion. 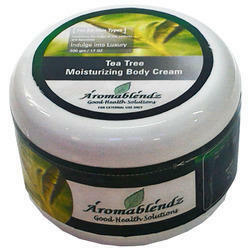 It is packed with high percentage of shea butter and other nourishing emollients and extracts. It is easily absorbed.A great product for skin in need of deep penetrating hydration. Application: Apply generously all over the body with gently circular strokes. Caution: Avoid application on open wounds & cuts. Store in cool& dry place. 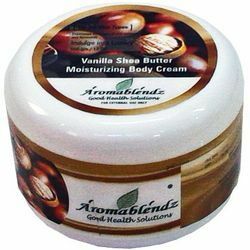 Looking for Aromablendz Body Creams ?